The sweet and neat little origami rectangle box is a great practical model that is simple to make! For a printable Pdf version of the rectangle box instructions, click here. You will need Adobe Reader installed on your computer in order to open the Pdf file. You can get Adobe Reader here. 1. Start with coloured side up. Fold paper in half. 2. Fold edges to centre line. 3. Fold outwards along creases shown. 4. Turn model over, and fold edges into centre line, crease and unfold. 5. Bring bottom corner up to the third crease. Flatten. 7. Fold up and tuck under. 8. Fold up and tuck under. 9. Rotate model then repeat 5-8 on other end of model. Finished Rectangle Box.You can also make slightly larger box for a lid. 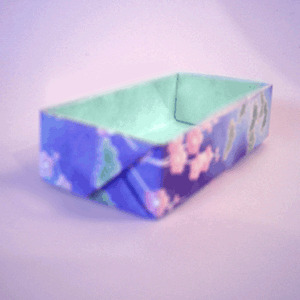 Learn to make other boxes like the origami rectangle box.